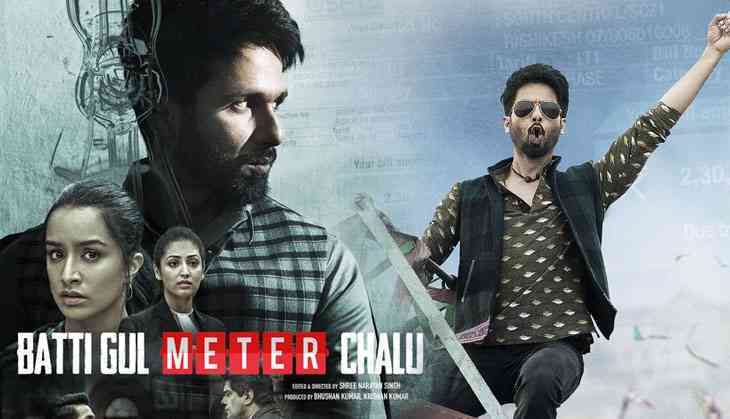 Shahid Kapoor, Shraddha Kapoor, Yami Gautam starrer film Batti Gul Meter Chalu is one of the discussing films of 2018. Toilet Ek Prem Katha director Shree Narayan Singh has made this film and after raising the issue of toilets this time the director picked up the social issue of electricity. The makers of the film have started the promotions of the film by releasing back to back posters, although the trailer is releasing on today on 10th August but the makers already have released the posters of the lead actors by introducing their characters. In these posters, it is clear that Shahid Kapoor is playing the role of fun loving guy who is a lawyer as a profession, and his love interest is Shraddha Kapoor. In one poster we can see Shraddha and Shahid on a bike in Haridwar. On the other hand, we have one more poster in which we can see the principal characters of the film. Shahid Kapoor and Yami Gautam can be seen in the courtroom, whether Sameer Soni is standing in the witness box. However, Shraddha Kapoor is looking totally intense in the poster. The film is releasing on 21st September 2018 and it also stars Divyenndu Sharma who also worked in Toilet Ek Prem Katha. Also Read - From Bajirao Mastani to Takht, Ranveer Singh is proving that he is the best choice for period films!